"Canis familiaris," the domestic dog, is descended from "Canis lupus," the wolf. Many thousands of years ago, wolves hung around caves, stealing morsels from man at the dawn of civilization. Submissive wolves may have left their canine pack to take up residence at the periphery of human camps. In return for watchdog duty, these beasts probably received food, shelter, and companionship in the human pack. Genetic variability and mutations in wolves produced domestic dogs of an amazing variety of sizes, shapes, and colors, dogs that were further refined into breeds created for specific purposes. Although the terrier puppy has never seen the great north woods and the Samoyed down the street never hunted a moose with a silent pack of wolves, they have wolf habits in common with all other breeds of dogs. All puppies, in the manner of wolves, need a den. Pianos and tables make great dens, but furniture doesn't have sides for confinement. Laundry rooms, spare bathrooms, and even playpens are too big for a puppy den; there's enough room in these enclosures for the pup to defecate or urinate in one area and still have room to play or sleep without stepping in the mess. In the wolf den, the mother wolf cleans up the cubs feces until the youngsters are old enough to defecate away from the den. The cubs learn that the den is a place to keep clean as well as a place of safety and comfort. A modern den can be a Fiberglas or wire crate that can be kept in any room in the house. It should be barely large enough for the pup to lie down comfortably. 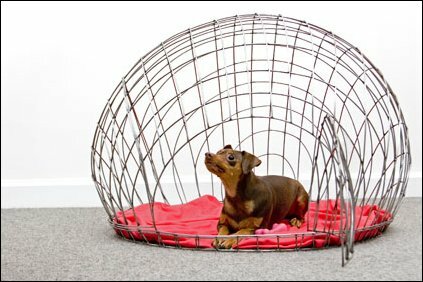 If your pup is one of the large breeds and you don't want to buy several crates as he grows, buy an adult-size crate and partition it so it fits his current size.